Built like a supercar, the Angelus U30 Tourbillon Rattrapante unites three coveted "haute horlogerie" complications in a contemporary, three-dimensional form that is unlike any other: the tourbillon, fly-back double column wheel chronograph and split-seconds (rattrapante), while also boasting automatic winding with a power reserve display. Angelus can look back on a long tradition in innovative chronograph wristwatches: this history of manufacture chronographs for the wrist began in 1925 with a monopusher. The company's first highlight was the 1942 launch of the Chronodato, the world's first serially manufactured chronograph with calendar. Throughout subsequent decades, Angelus released ever more groundbreaking chronographs, many of them including world-first complications. So when it came to developing an entirely new chronograph movement, Angelus’ present-day engineers and watchmakers knew that they had to do something utterly exceptional. After five years of intensive research and development secured by several patents, Angelus now presents the U30 Tourbillon Rattrapante. 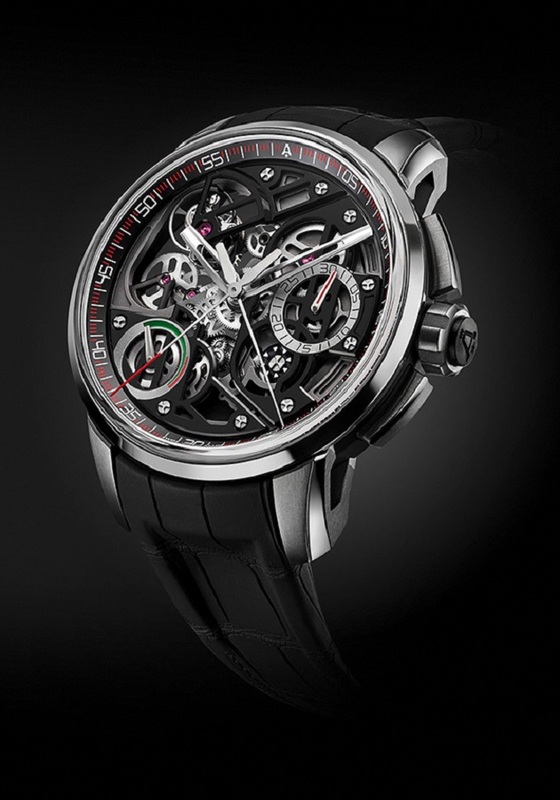 It features a one-minute tourbillon, a fly-back double column wheel chronograph, a split-seconds (rattrapante), a self-winding mechanism and a power reserve indicator. 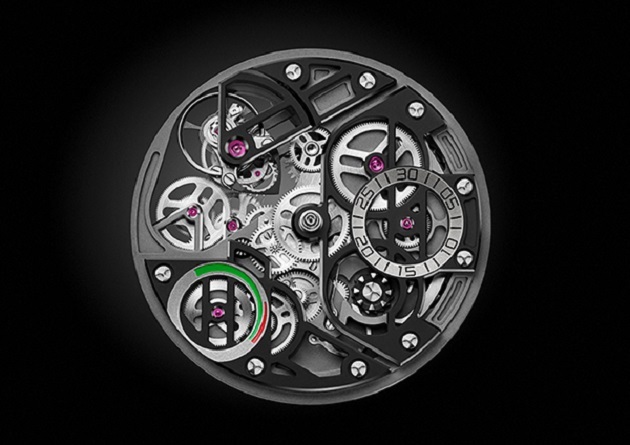 However technically complicated that combination is, it is the movement's contemporary architecture and three-dimensional design that make the Angelus Tourbillon Rattrapante truly unique. All of these complications have been re- engineered based on structural optimization and skeletonized to reveal as much of the movement as possible on the dial side, all while ensuring maximum legibility of the time and chronograph functions. The skeleton bridges alone allow the display of no fewer than 15 different wheels dial side! The movement hosts a number of complications all fully integrated rather than modular add-ons that are built on several layers, all visible thanks to the skeletonized bridges that create a form evoking the “A” of Angelus. To further increase the impression of depth, the movement is fully transparent around the tourbillon and treated in various shades of black and grey. A tour of the open dial begins with skeletonized central hour and minute hands. High legibility is ensured by high-contrast black movement bridges underneath light-colored hour and minute hands, as well as the fact that the latter have slightly curved profiles to catch the light from any angle. The one-minute tourbillon occupies a quarter of the dial space and can be appreciated through the skeletonized movement plate and bridges at 10 o'clock. The tourbillon is high- beat with 4 Hz / 28,800 vph, a perfect fit for the watch’s character. The tourbillon cage is entirely made of non-magnetic material and reduced to the maximum to further minimize mass and optimize performance. Not only can the tourbillon itself be fully admired dial side, but also all its gearing, creating an intriguing micro-mechanical display. The power reserve indicator, with visible gears and wheels, is positioned at 8 o'clock directly integrated onto the skeletonized bridge: a green sector indicates ideal torque while red highlights that it's time to wind the watch. The chronograph function of the U30 Tourbillon Rattrapante is among the most refined and complicated in existence: the split-seconds or “double” chronograph. This type of chronograph is highly complex to achieve, especially when combined with a tourbillon, as the energy consumption of a rattrapante mechanism is very high.